I had the book Born to Read on my lap as I waited for my children to finish brushing their teeth. My daughter jumped onto the bed first, noticed the book, and declared, "Hey, I was born to read!" Judy Sierra along with illustrator Marc Brown tell the story of Sam who knew he was "born to read" from the moment he could read his name above his bed. 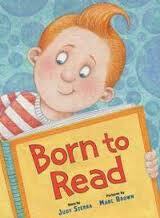 Sam's mother nurtured his love of books by reading picture book after picture book while he stood in his crib. Sam quickly learned that "readers win and winners read!" and that "readers can do anything!" In an interview with TeachingBooks Judy Sierra said that she hopes the book, "convinces reluctant readers that reading will help them get better at just about anything they want to do, from winning sporting events to toppling giants." Judy Sierra learned as a children's librarian and a traveling puppeteer that children love folktales and books that are funny and scary (Teaching Books and Patricia Newman). She is careful about the books she chooses to write, "I have to choose subjects and themes I know kids (and parents and teachers) will not just like, but go wild about." 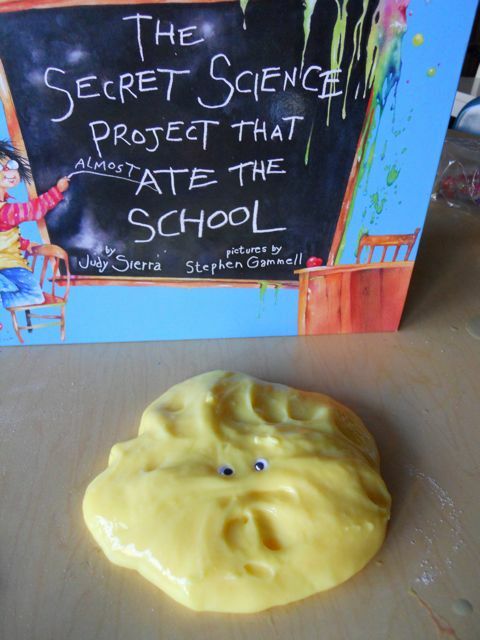 This week we read The Secret Science Project that Almost Ate the School. When I saw the title I thought the book was going to be similar to books we read earlier this year, Plantzilla by Jerdine Nolen and The Fungus that Ate My School by Arthur Dorros. However, Judy Sierra differentiated her book from the these by writing in verse. On Judy Sierra's website she describes the effort that went into writing this book, "The most difficult part of The Secret Science Project that Almost Ate the School was writing it in perfect metered rhyme. It took almost four years and two editors to get it just right." Sierra certainly got it right! It was a joy to read aloud at bedtime and before we celebrated her birthday by making Super Slime. 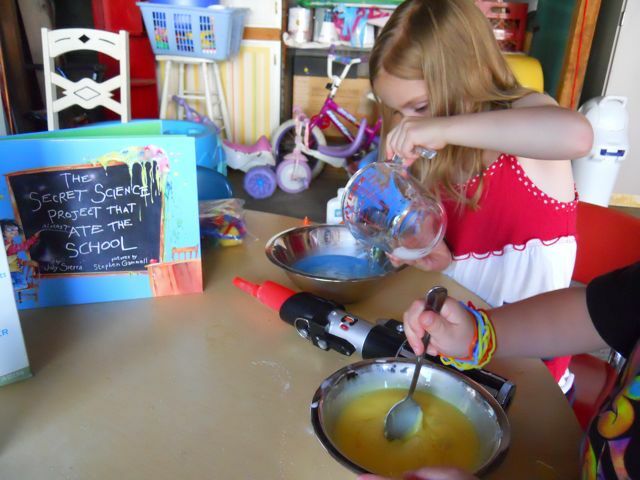 We started with a recipe from Steve Spangler's Science Webpage. The ingredients we needed to make Super Slime were a bottle of Elmer's glue, water, food coloring, and Borax. We found Borax ($4.49) with the stain fighters and laundry detergent at the grocery store. While at the grocery store, my son informed me that he was a little nervous about making Super Slime. He was convinced that the Super Slime was going to eat our house! The illustrations of the growing slime creature by Stephen Gammell were still fresh in his mind even though we read the book for the first time over two weeks ago. I think Judy Sierra described the illustrations perfectly when she stated on her website "Stephen Gammell's illustrations are beautiful, funny and frightening all at the same time." You will notice from the pictures below that my son's anxiety disappeared quickly once we got started with the project! 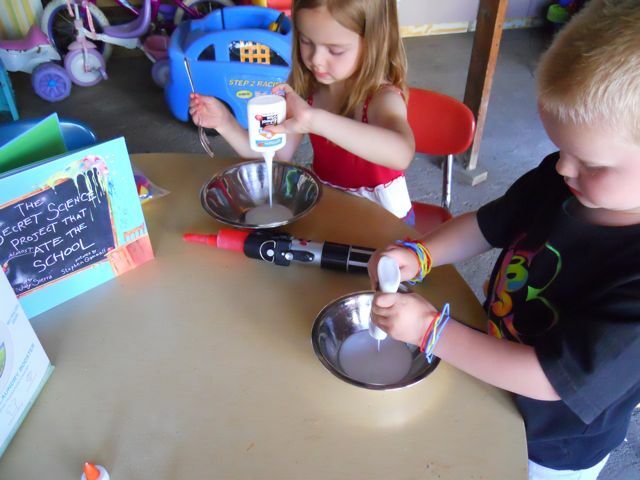 The first step was to pour an entire bottle of Elmer's glue in a mixing bowl. Then, we filled the empty glue bottle with warm water, shook the bottle really hard, and emptied the water into the mixing bowl with the glue. After stirring the contents of the bowl once more we added a few drops of food coloring. My daughter chose blue and my son chose yellow. 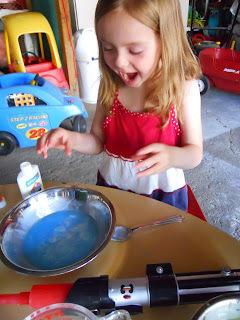 Separately, we added one teaspoon of Borax to 1/2 cup of water and stirred. 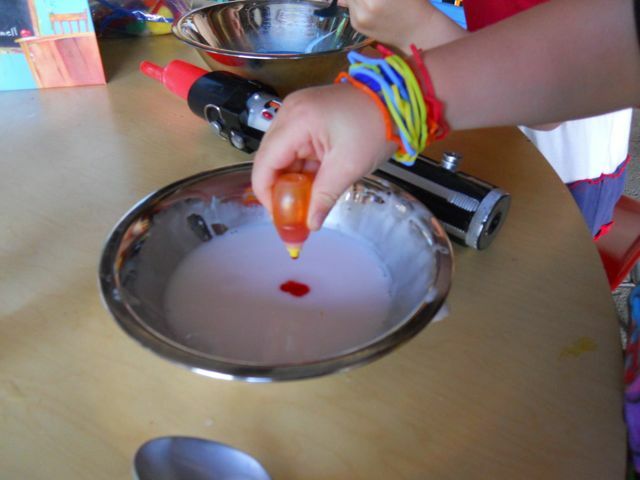 Then, the water/Borax solution was then added to the mixing bowl. 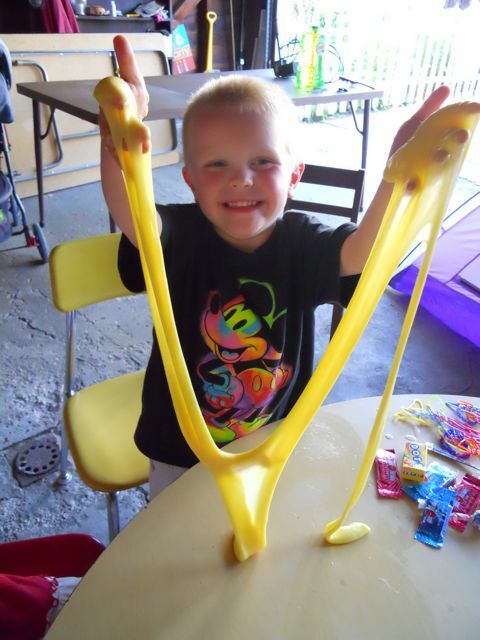 Super Slime started to form immediately. We initially stirred with a spoon but then my children opted to use their hands. There was a little water left in my daughter's bowl that was later discarded. We had a few googily eyes to make the slime "wink" at us just like the end of the book. My children enjoyed this project so much that they played with the Super Slime for almost an hour. I brought out some candy which was another element of the book. The directions on the package of Super Slime instructed the young scientist to "Feed it sugar till it swells 1,000 times in mass. Stand back as it erupts into a harmless cloud of gas." 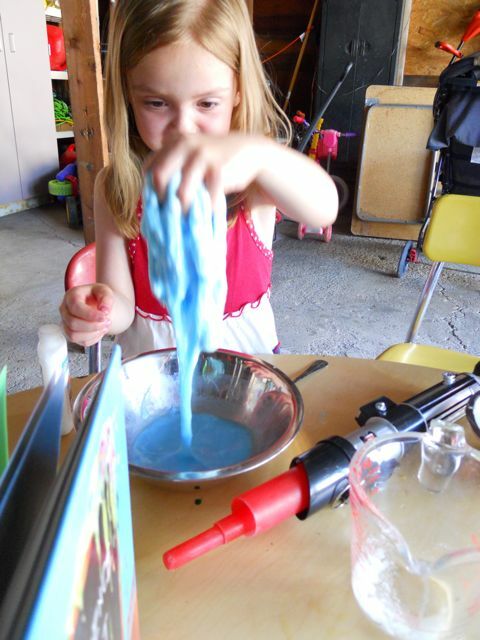 Our Super Slime didn't grow and it didn't almost eat our garage, but it sure was a blast! 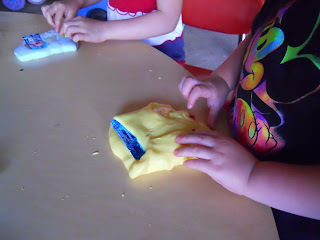 Note: We stored our Super Slime in a Ziploc baggie to use again another day! Hello. Thanks for signing up to follow my blog. I came here check out yours and I love it! It's such a great idea to celebrate authors on their birthday. I signed up to follow you. 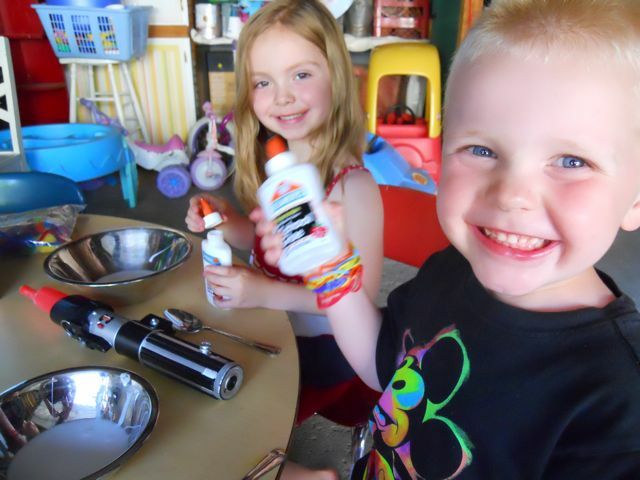 By the way- love the lightsaber on the table in your pictures lol. My son has the same one!